OPC Alarm & Event를 수집하여 저장하는 솔루션이다. Allows retrieval of data by search criteria: date, type of alarm, area, etc. Automatic A&E configuration. 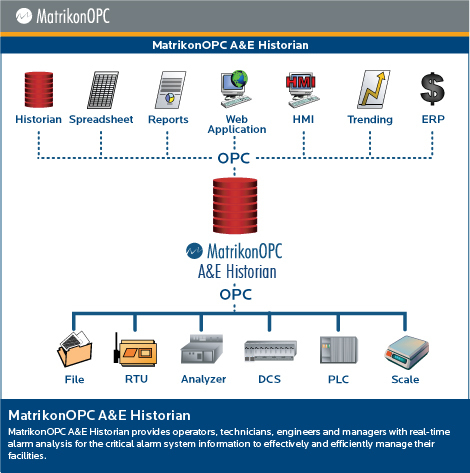 The MatrikonOPC A&E Historian does not require any programming or even manual setup. Simply connect to an OPC Server and start collecting A&E data instantly. Leveraging your existing reporting tools such as Microsoft Excel or any other reporting tool you have for analysis and reporting. Interoperability with all complaint A&E OPC Servers.